The Pear, like the apple and many other forms of fruit, is an inheritance from remote times and crude beginnings. In a special degree it is a triumph of the horticulturists' skill. The thorns which covered the trees that originally flourished in Syria, in Egypt, and in Greece, have long since disappeared, and the one-time acrid fruit has become metamorphosed into the luscious forms which, under many varietal names, hold the place of the favorite fruit of modern times. 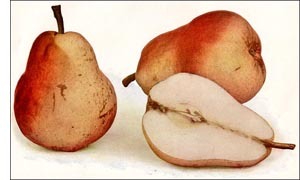 More than to any other source are we indebted to the French Huguenots for the introduction and cultivation of the pear into this country. Many examples of this early cultivation may still be seen in the old trees in Long Island and New Rochelle, in Michigan and Illinois. The introduction by these people of the French method of propagation upon the quince stock gave an immense impetus to the cultivation of the fruit, as by this process the period of fruiting was reduced from twenty to thirty years to three or four years. The pear, like the apple, peach, plum, cherry, and many other forms, is referred to the Rosaceae, or Rose family. It belongs to the genus Pyrus, which also includes the apple, the crab apple, the mountain ash, and the historical rowan tree. For the most part, the American forms have been derived from the European Pyrus communis and the oriental Pyrus sinensis. The trees differ in general aspects from the apple tree in possessing a more pyramidal form, in being considerably longer as a seedling plant, and, while less hardy, being longer lived. It is propagated by seeds, cuttings, layers, budding, and grafting, but its sensitiveness to climatic conditions has materially lessened its distribution in the United States.